Home» TS Latest G.Os » Telangana Employee Family Pension Arrears of undrawn Amendment Order as per G.O.NO:80. Telangana Employee Family Pension Arrears of undrawn Amendment Order as per G.O.NO:80. TS Arrears of undrawn pension and Family Pension - Certain Amendments to A.P.Treasury Code, Volume-I as per G.O.NO:80 , TS Pensioners Family Pension Arrears of undrawn Amendment Order as per G.O.NO:80. Telangana TS Arrears of undrawn pension and Family Pension - Certain Amendments to A.P.Treasury Code, Volume-I - Orders – Issued. G.O.Ms.No.304, Finance (TFR) Department, dated 24.04.2003. From the Senior Accounts Officer, O/o. the Principal Accountant General (A&E), A.P. Hyderabad letter No.PM/III/2012-13/DTO-MEET/40388, dated 29.05.2012. Finance Department’s Memo.16146/248/TFR/2012, dated 20.06.2012. Therepresentation of Telangana Treasuries Employees Association, Hyderabad, Lr.No.22/TTEA/2016, dated 03.03.2016. Finance Department’s Memo No.273/73/TFR/2016, Dt:28.03.2016. 6. Letter from the Director of Treasuries and Accounts, T.S., Hyderabad, Lr.No.H1/1392/2016, Dt:07.05.2016. 1.In the G.O. 1st read above, orders were issued as a part of administrative reforms anddecentralizing the powers delegating all administrative sanction powers to the concernedSpecial Chief Secretaries/Principal Secretaries/Secretaries of the administrative departments ofSecretariat concerned to the Pensioner/Family Pensioner in so far as sanction of arrears of undrawnpension and family pension duly verifying the rule position envisaged in S.R.86 (b), 87(a), 89 (a) under T.R. 16 of A.P. Treasury Code Volume-I read with Article 55 of A.P. FinancialCode Volume-I. 2.In the reference 2nd read above, the Senior Accounts Officer, O/o. the PrincipalAccountant General, (A&E) A.P. Hyderabad has informed that the present conditions where theminimum pension is more than the limits prescribed, it is felt that these limits are unrealistic andneed to be changed/enhanced to cater to the need of the situation. The pensioners are put to a lotof hardship in claiming the arrears which remain undrawn even for one month and a pragmaticview need tobe taken in this issue and requested to take necessary action to enhance the limitsprescribed long back. 3.In the reference 4th read above, the Telangana Treasuries Employees Association, Hyderabad has submitted a proposal for increasing the financial limits/period in respect of undrawn pension. 4.In the reference 6th read above, the Director of Treasuries and Accounts, Telangana, Hyderabad has submitted a proposal for increasing financial limits / period in respect of Un-drawn pension. 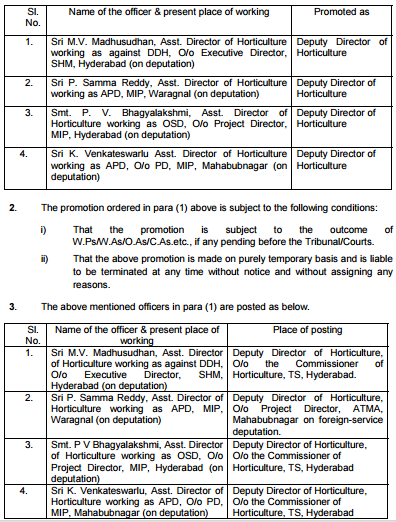 6.The officer should join in the promoted post within (15) fifteen days from the date of receipt of posting orders failing which he shall forfeit all his rights to the promoted post both for the present and future in terms of Rule II(b) of Telangana State and Subordinate Service Rules, 1996 read with G.O.Ms.No.123, dt.14.3.2001. 7.The Commissioner of Horticulture shall take necessary action and intimate the date of joining of the officer to the Government for information and record. APC & SECRETARY TO GOVERNMENT.